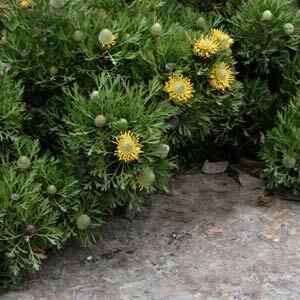 One of the best known Isopogon varieties is Isopogan ‘Little Drumsticks’, a long lived low growing shrub widely used as a ground cover plant. The botanical name is Isopogon anemonifolius, which is commonly called ‘Broad leaved Drumsticks’ for the foliage. The species is found in New South Wales and is a low growing ground cover or small shrub that could well be used in a rock garden. However it is the form known as Isopogon ‘Little Drumsticks’ which is a compact low growing type that gardeners have fallen in love with. With attractive foliage and small yellow flowers in spring, this is a hardy plant that is drought tolerant once established. Flowers are followed by small rounded seed cones on the end of stems, looking a little like ‘Drumsticks’. A great plant for the front of the border where it can be allowed to flow over the edge of s path or lawn. When in flower it attract butterflies, birds and bees to the garden. One of the first cultivated Australian Native plants. ‘Little Drumsticks’ (pictured right) is a lower growing cultivar. Excellent is a sunny garden border when used as feature ground cover plant near the front of the border. A good plant to grow beside a path where it can act as an informal border, also suited to growing in containers. Isopogon ‘Little Drumsticks’ will reach around .4m in height with a spread of around .6m so give it appropriate room.